An essential part of sustainability is to be true to seasonal foods. If a food is in season then you can be pretty sure that it has its best nutritional value, its best price points and most important of all its best flavor. Organic production is much easier to do when a product is in season, so the price difference between organic and non organic diminishes. This means it is financially more sustainable as well. It is now Citrus season! Blood oranges, grapefruits and tangerines are flavorful and cheap. Asparagus is also coming on strong, though it came in a bit later than last year. To find our seasonal weekly and daily specials, check out our Facebook Page. Happy Hour has started up! Every day from 4:30pm-6:00pm draft beers are $3.50 a pint, and our house wine is $3.00/glass, $6.25/half carafe. The newest versions of our Lunch and Dinner menus are now available online, as well as our current menu for Weekend Brunch. The Bread Workshop is proud to have hosted three sessions with the Sprouts Cooking Club, a Bay Area program designed to get kids cooking. Using our facilities under the tutelage of our Owner and Chef du Cuisine, William Briscoe, the Sprouts kids made individual-sized organic apple pies, cheesecakes, and pumpkin pies. The enthusiasm of the kids was infectious and they produced some top quality pies here at our bakery. One of the participants, Sam, was present for each session, and after expressing interest in Vegan Cupcakes I was making kindly shared his own recipe with me. I’ll be testing it out at home in here, in the Workshop’s kitchen. 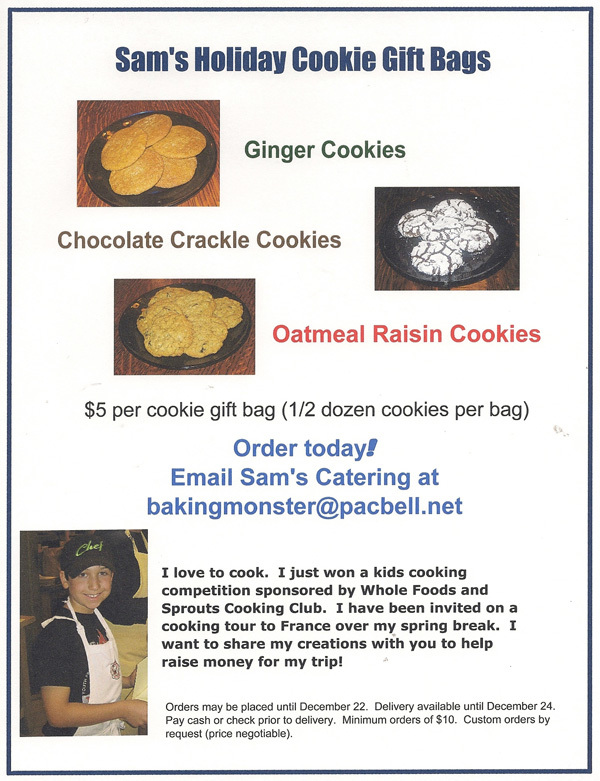 Sam also won a kid’s cooking competition sponsored by Sprouts (see his win on YouTube) and has been invited on a cooking tour of France over his Spring Break. He’s currently raising money for his trip by selling holiday cookies which can be ordered (a $10 minimum) until 12/22. Order an organic holiday pie from us for the dinner table, and a few bags of cookies from Sam for under the tree! In an intense culinary competition in Delores Park, Raynn captured a Sammy for the second best grilled cheese sandwich, missionary style, using a Bread Workshop French Batard. Though Raynn has been involved with the grilled cheese competition for years, this the first year she’s won a Sammy. The semifinals are to take place on April 25th in Los Angeles, but because of concerns over sacrificing quality due to transportation issues, Raynn will only attend, not compete. The Bread Workshop is proud to announce that we have been voted the second best sandwich shop in the Bay Area by the readers of the San Fransisco Chronicle’s website (www.sfgate.com) in a recent competition entitled Best of the Bay. The competition was held during the beginning of this year, ending in early March, and was open to any and all sandwich shops in the Bay Area.